Sometimes I imagine it’s a bit of a mystery what makes Women Against War projects happen. But in the case of our 6-months’ work on hosting AFSC’s powerful poster exhibit, Humanize, not Militarize, we can learn below how this project emerged and kept expanding, all the wonderful new community partners we made, and the terrific teamwork of the large number of WAW members involved. If you might like to be part of our next effort, please e-mail info@WomenAgainstWar.org, and we will let you know what’s next! The report below was written by Anita Stanley who coordinated this project – with cheerful patience and marvelous organizational skills. Thank you from us all, Anita! You made it possible for us to bring to new audiences the powerful message of the exhibit: the interconnection between the US militarized foreign policy, our racist and increasingly militarized criminal justice system and our increasingly militarized borders – all sadly needing much thought and advocacy these days. The idea to bring the Humanize, not Militarize project to the Capital District was first conceived by Maud Easter in January of 2016. She spotted it on the website of the American Friends Service Committee www.humanize.afsc.org and wrote to Mary Zerkel, the AFSC staff member in charge. 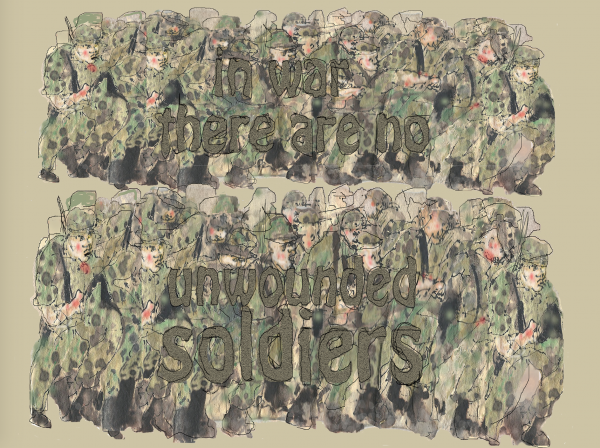 At that time it was titled All of Us or None, but had just been changed to Humanize, not Militarize. Mary was delighted to work with Women Against War again, and the seed was planted. Maud brought the idea to the Beyond Afghanistan/No Drones Committee in February, and the group decided to move forward with it. Initially the plan was to display it in the summer of 2016, but planning for the election primaries became a priority, so it was pushed out to the fall. Mabel Leon began a thorough study of the posters, and made suggestions of how we could divide them up for different sites. Finding Display Sites: The rest of the committee began exploring different venues for the display, and whether/what kinds of events we might want to accompany the exhibit. Since planning for the annual meeting was underway by then, the committee changed the target date to late winter or early spring of 2017. 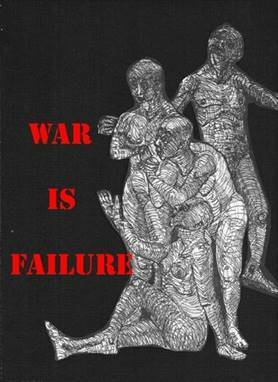 Connie LaPorta was asked to create a brochure to accompany the posters at each venue, which would contain a current schedule of the different display sites, information about AFSC, information about WAW, and a poem from the AFSC website about militarization. Mabel then drafted a letter to be sent to potential venues, and Mickie Lynn edited it for release. We divided up the list of possible sites to contact, and began the contacts. 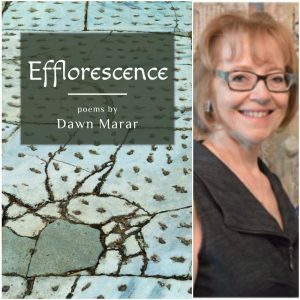 Even though Maureen Aumand wasn’t able to attend our committee meetings, she continued to contribute ideas for venues, and make contacts herself. Progress! 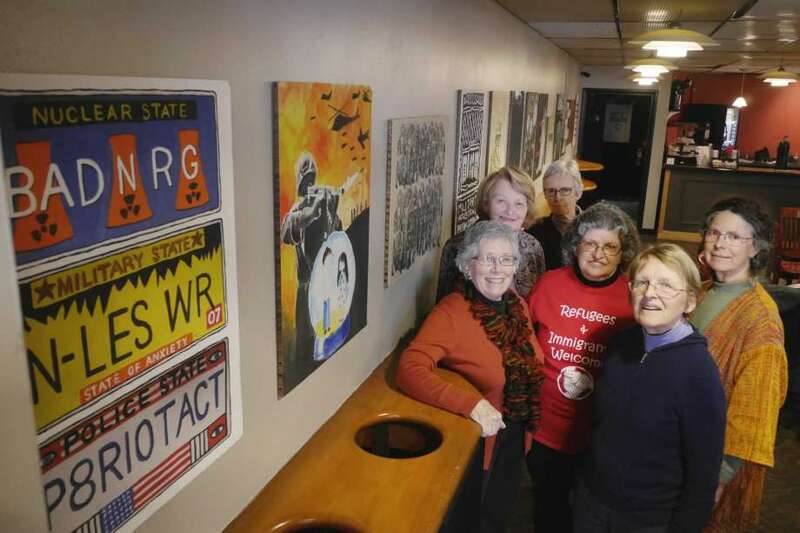 The Unitarian-Universalist Church in Albany was the first site to agree to host the exhibit, and plans began for an accompanying event, such as a speaker or movie. Maureen was making solid progress with Capital Repertory Theatre to schedule a showing during the run of An Iliad in March of 2017. Anita Stanley agreed to be the scheduler for the display, and post online the dates, information about each site, and the WAW members responsible for hanging and tabling. Anita attended the meeting of the Social Responsibility Council at the UU Church, where they requested that we show Jon Stewart’s film “After Spring”,a movie about Syrian refugees, when the “Humanize” posters were up. They decided to have a church potluck on the evening when the film was shown, and asked that we plan a small panel to discuss the movie after the showing. Maureen agreed to facilitate the discussion. They also agreed to allow us to put out the WAW tabling materials on that night, and to host Dahlia Herring for a short presentation about the Capital District’s plans to address the influx of refugees to the region. They also decided to make a donation toward the cost of the film and the exhibit, depending on how much money was taken in from donations on the night of the film. WAW and FUUSA would share publicity tasks for the local listserves and newsletters. More sites: Maureen continued to explore new possibilities, and received a positive response from the UAlbany Performing Arts Department, to host the display during the run of REBEL/Sister in April. We were given permission to table at three of their themed “talk backs” after the performances. 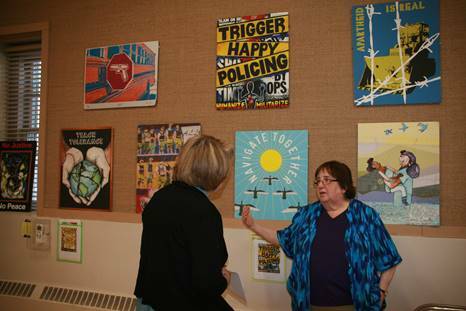 Alexandra Lusak from the Oakwood Community Center in Troy accepted our request to hang Humanize there. They decided to plan an opening reception for it, at one of their Monday night Soul Cafe dinners for the community. Maureen contacted Rex Smith at Albany Pro Musica, to explore the possibility of hanging the exhibit at EMPAC on the night of their performance of The Armed Man in May of 2017. 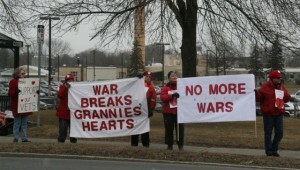 The board of APM was encouraging local organizations to plan peace-related activities in the weeks leading up to the performance of this anti-war composition. The posters of Humanize fit perfectly with that effort, and WAW was glad to join in by tabling on the night of the concert. WAW was allowed to display three of the posters as well, and accepted the many donations that audience members offered. In addition, the exhibit was featured on a weekly television show called AHA!, broadcast on our local PBS station, WMHT. 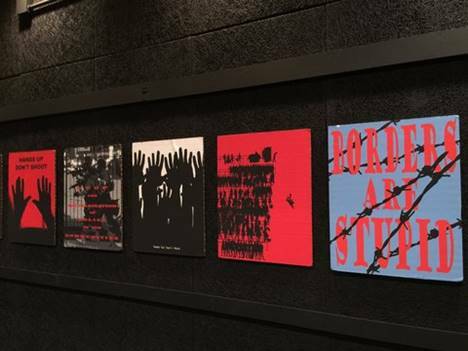 In order to illustrate the themes of The Armed Man”, the posters were woven in among the different segments of the program. With the cost of shipping the exhibit, the fee to rent After Spring, and the charges for printing, ink, and Velcro strips for hanging, we realized that we needed an additional supply of money to cover our costs. Maud sent out a request for donors, and people responded with generosity. We also began to plan for refreshments for our reception on the night of the An Iliad performance, and a number of WAW members offered to help. addressing the mental health needs of returning veterans. She was planning an after-performance talkback, which included Dan Wilcox, our local anti-war poet, Dr.Ed Tick and Kate Dahlstedt, the founders of Soldier’s Heart, a participant in their program, and the actor and the cellist in An Iliad. She also arranged for a photographer from the Times-Union to come out and take pictures of the display, in preparation for a short article in the newspaper. 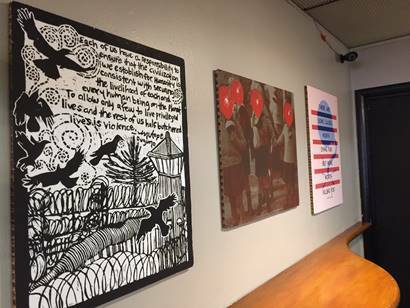 We asked AFSC to include art materials with the poster shipment, which people could use to make their own posters, inspired by the exhibit. We also requested plastic sleeves in which to put information about each artist and their specific posters. At some sites this information was put in a notebook for persons to look through, and in others, the information was hung under the posters. More Sites! The Upton Women’s Center at Russell Sage College was the next venue to accept our invitation, and Shealeen Meany, the director of the Center, planned a reception for their opening night. WAW arranged for Dr. Mussarat Chaudry, a local Muslim interfaith leader, to give two short presentations on women and Islam on the night of the reception. Many of the Sage students made posters, and took WAW flyers and our brochures about the exhibit. 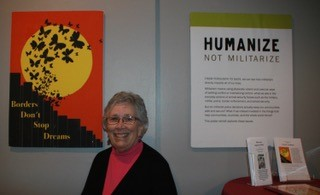 Maureen also contacted Bethlehem Neighbors for Peace about hosting our Humanize display during their annual meeting. They agreed to exhibit the posters, and put on a staged reading of the anti-drone play Predator on that night as well. 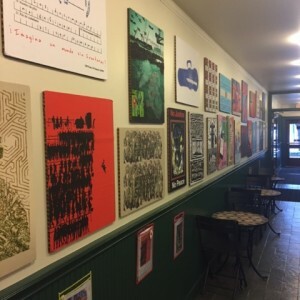 There were many instances of overlap between the runs of the posters at the different venues, and WAW allowed each venue to choose the works that they wanted. This splitting of the exhibit worked well, and whatever posters were not being used were stored in a WAW member’s home. Project extended again! WAW members split up the list for thank-you notes to the different sites, and began to make plans for packing up the posters to send back. Soon afterward we were contacted by Aili Lopez of C.R.E.A.T.E., a new organization with art studios in Saratoga and Schenectady, with a mission of addressing mental health needs through the visual arts. They felt that Humanize would be a good fit for their participants. We agreed, and CREATE began to plan three workshops entitled Activism and the Art of Poster-Making. WAW members from Saratoga were asked to help with the exhibit, and attended the workshops as well. Wrapping up: The Beyond Afghanistan/No Drones Committee of WAW pitched in for a pack-up party for mailing the exhibit back to AFSC. After this, the committee gave a mid-summer “thank-you” party for all the volunteers involved with the six-month project. Members agreed that Humanize had reached a wide variety of audiences, especially in the arts, that had not been aware of WAW and the issues we address before this. Our collaborations with local groups were successful, and served to strengthen our bonds with other organizations in the peace and justice community. We are appreciative of the donations given by individuals and organizations involved with the display. 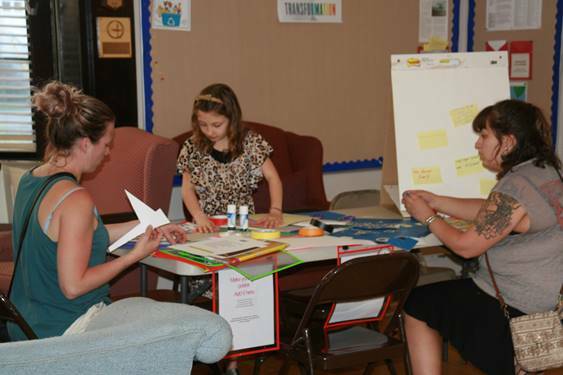 Members feel that our goals as an organization were well-represented by the issues raised by the Humanize posters, and that the people who came to see the display are likely to be much better informed now than they had been before. 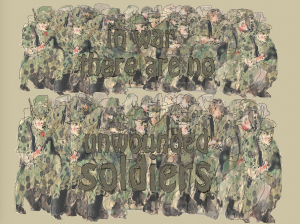 This entry was posted in Afghan War [Beyond Afghanistan/No Drones Project], Other Peacemaking, Past Projects, Working in coalition and tagged American Friends Service Committee, Humanize Not Militarize by admin. Bookmark the permalink.